This post is brought to you by Stonyfield Greek Yogurt and Unreal Candy. It's almost October 31st! There is already a lot of chocolate in my house - I like to buy the big bulk bags that are on sale all month long. We live in a neighborhood that is pretty busy with trick or treaters. I'll balance a barking dog with one arm and allow the kids to choose from the bowl in my free hand. To keep myself from gobbling up all their chocolate before it's go-time, I keep a stash of my own candy around. And instead of eating it straight up, I like to add them to meals so it's more filling. 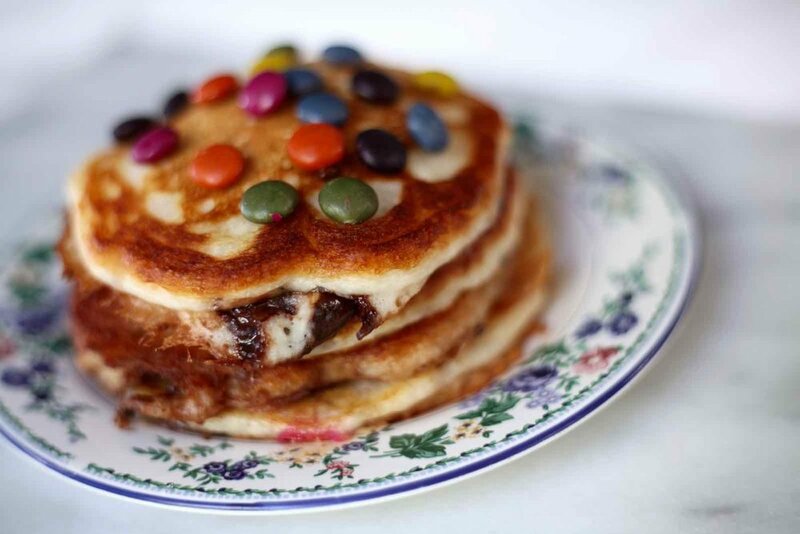 Today, I'm making Halloween Candy Pancakes for breakfast. As a Stonyfield blogger, I receive yogurt on a regular basis to develop recipes. This month they are also sending me Unreal Candy, which is making M&M's and Reese's Peanut Butter Cups with less sugar and organic ingredients. Everything, down to the candy color coatings, are all-natural. Plus they're sustainably sourced and fair trade. This is a batter for Greek Yogurt Pancakes, which is the secret to super fluffy ones. Bonus - they have extra protein! Chocolate Chip Pancakes are something I always order at diners. They're so sweet I never add syrup. This stack definitely doesn't need anything on top - they are chock full of candy coated milk chocolates and dark chocolate peanut butter cups. The candy itself really does not taste very different from the other stuff. If anything, it's a little less artificial; more homemade. In a medium bowl, mix the yogurt, eggs, milk and vanilla together. In another bowl, mix together the flour, baking powder and salt. Add the dry ingredients into the wet. Melt coconut oil in a nonstick pan over medium heat. Use a 1/4 measuring cup to spoon the batter onto the pan. 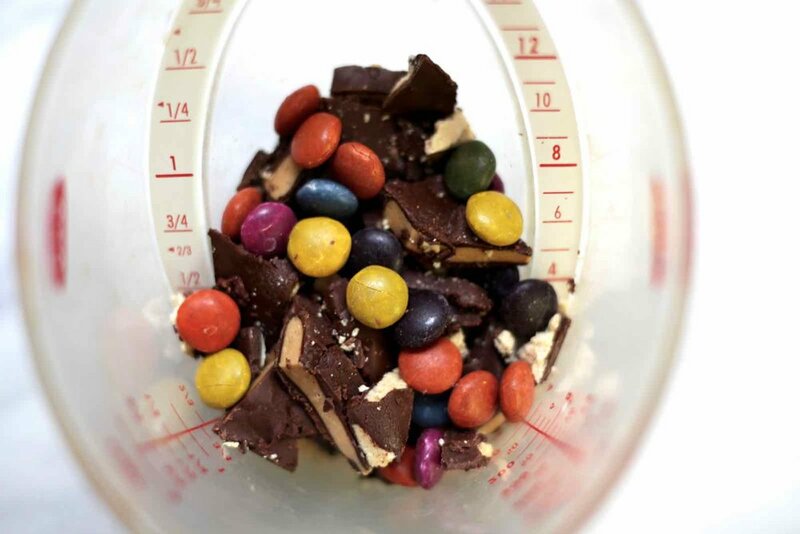 Immediately add the chopped up candy to each pancake - not too much or the melted chocolate will get messy. When the pancakes get bubbly (about 2-3 minutes) flip them over and cook for another minute and a half, until golden brown. Finish with the remaining batter. Serve the pancakes with additional Halloween candy on top. This post is brought to you by Stonyfield Organic Yogurt. Thank you for supporting the partnerships that make this blog possible!